As time goes by and technology improves, we are constantly seeing prices for previously groundbreaking technology fall to levels which allow for the adoption of this technology by the masses. 3D printing is one of these technologies, in that now, virtually anyone in the developed world can afford a desktop 3D printer. At the same time though, other technologies are following in this same path. For example smartphones, tablets and mini computers can now perform tasks that a machine 20 years ago, at 100 times the price, couldn’t even have come close to achieving. For one company out of Japan, called exiii, this has allowed them to create a myoelectric hand which not only is exponentially more functional than prosthetic hands from a decade ago, but also is available at just a fraction of the price. 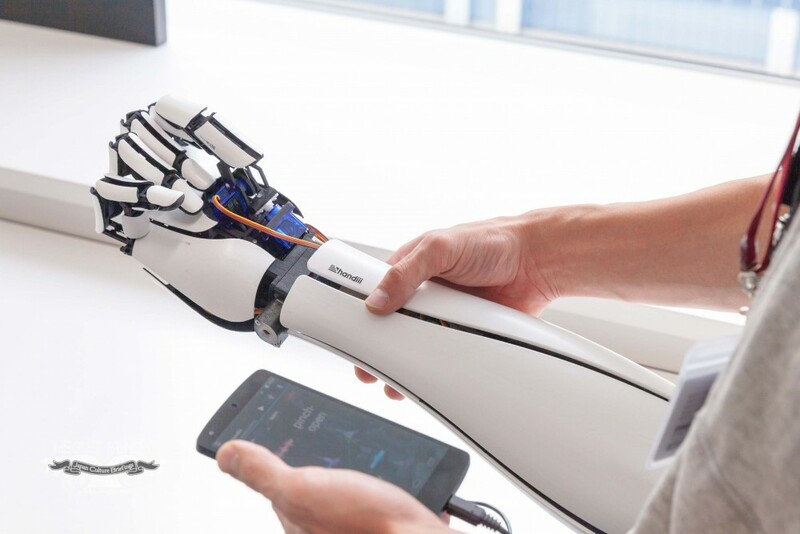 In development for several years now, the latest version of exiii’s handiii bionic arm was unveiled last week at SXSW, to the amazement of onlookers. The hand, which takes on the appearance of something very similar to what you’d see in Will Smith’s 2004 film, I, Robot, also has a bit of spider-like look to it when the fingers are bent and flexed. The greatest benefit of the handii bionic arm, however, is the price tag. Incredibly, unlike other pricey myoelectric hands and arms, which utilise expensive custom built computer systems, the handii uses the simplicity of a smartphone. An EMG sensor on the wearer’s arm sends signals to the smartphone which processes these signals and then sends a signal back to the hand, telling it which movements to make. In addition, exiii was able to create the hand in such a way that it only takes one motor to control each finger. Even though the fingers consist of three joints each, one motor located at the base joint is able to operate the entire finger. The handii, which is developed with 3D printing technology, is also very customisable in that it can be purchased in varying colour options. Also the fingers are interchangeable, meaning that different fingers can be added on for different situations. Perhaps you want a finger with a rubbery texture, or perhaps one with an electrical module. Perhaps you just want to change the colour of the fingers. This can all easily be done. Best of all, exiii is aiming to make the handiii bionic arm open source so that others can take the design and iterate upon it, hopefully improving the design and functionality in the process. Currently the company is selling a purpose-built robotic hand to enterprises that are interested in using the hand for their research via a form on their website. It should be interesting to see how well this device catches on. Everyone has a smartphone now-a-days, so the affordability could make this an attractive option for people all around the world who are missing hands. What do you think about the potential that this device could unleash on the prosthesis market?